Dwayne Haskins throws a pass against Michigan. The Ohio State quarterback tore up the Wolverines’ secondary and will post a stiff test for Northwestern. 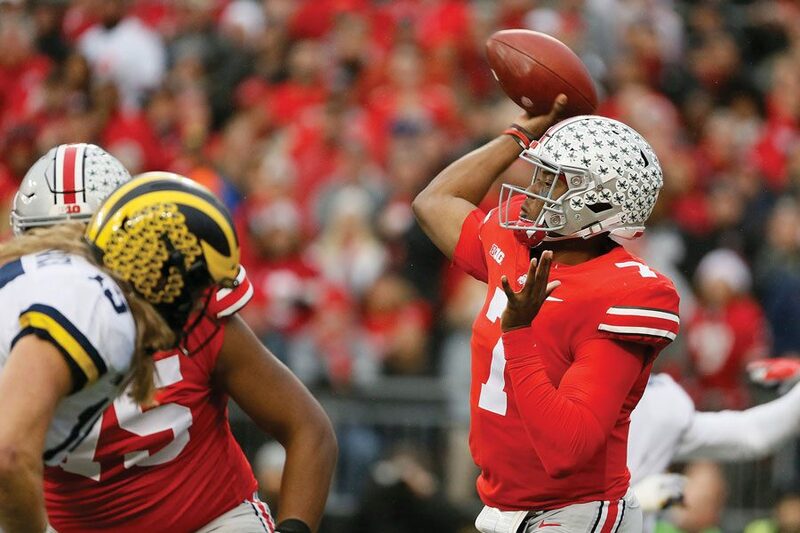 Ohio State quarterback Dwayne Haskins’ 2018 season is the best of any Big Ten signal-caller ever — and now he’s set to face Northwestern. Haskins, named Big Ten Offensive Player of the Year this week, has thrown for more yards and more touchdowns in a single season than any quarterback since the conference was founded 122 years ago. Current NFL stars Drew Brees, Russell Wilson and Kirk Cousins all played at least one season in the Big Ten. Brees, the NFL’s all-time leader in passing yards, played four, including three as a full-time starter. Haskins has surpassed all of them in his first year as a starter. And that’s not all. Among the 12 Big Ten quarterbacks who have attempted at least 200 passes this season, only two have thrown fewer interceptions than Haskins. Tasked with slowing down the man who put together the best passing season in conference history: the seventh-best pass defense in the Big Ten this season, by yards allowed per attempt. The secondary has been decimated by injuries throughout the season. Senior cornerback Montre Hartage, expected to play against Ohio State, has missed the previous two games with a lower-body injury. The man who started across from Hartage early in the season, freshman Greg Newsome, has been out for months. Newsome’s replacement, junior Trae Williams, hasn’t seen the field since the Notre Dame game. Deeper in the defensive backfield, senior safety Jared McGee didn’t see any action on defense in the past three games, though he’s expected to be back at safety Saturday. McGee’s return will alleviate the burden on redshirt freshman cornerback Cameron Ruiz and sophomore safety Travis Whillock. McGee is expected to start alongside sophomore safety J.R. Pace, while Hartage and Williams are both expected to return at the starting cornerback spots, relegating last week’s starters — Ruiz and junior Alonzo Mayo — to the bench. Pace is the only member of the likely starters to play in every game this season. Beside Haskins, the group will be lining up across from a fast, athletic group of receivers led by Parris Campbell (903 yards, 11 touchdowns) and K.J. Hill (820 yards, six touchdowns). Campbell and Hill are far from the only weapons in a deep Ohio State receiving corps that boasts five players with more than 300 receiving yards. The Wildcats, for comparison, have only three players over 200 yards. The Ohio State passing offense is coming off its best performance of the year, a 396-yard, 62-point decimation of Michigan, which has allowed the fewest yards per game in the nation. Defensive coordinator Mike Hankwitz’s man coverage scheme often relies on cornerbacks to make crucial plays, part of the reason why Hartage ranks third in the conference in pass breakups. The Wolverines employ a similar reliance on man-to-man defense and got burned for it. If something similar happens to Hartage, Ruiz and company, NU will be in trouble in its quest for a conference title.